This review was first posted on Music, Books and TeaAnyone who visits my blog knows that I’m a huge fan of dystopian fiction. So when I was asked to review Terra, it was a complete no-brainer for me. And this is dystopia done really, really well.I loved the concept of the world in Terra. The Skycities and Groundlands reminded me slightly of The Hunger Games mixed in with the world from Under the Never Sky. Whilst that idea itself isn’t wholly original, the idea of some of the Ground-dwellers having to scavenge metal and wires as a means to survive was. And it’s a crazy idea, but it’s not hard to imagine a world like the one in Terra happening to us in the future. 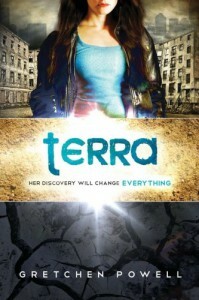 Terra was a brilliant main character. She had a strong voice and wasn’t afraid to do whatever it took to survive and look after her younger brother Mica, especially as they had been abandoned by their father. I really admired her strength, from when she was attacked by raiders to her brutal interrogation from Wolfe, she didn’t back down and she didn’t divulge any helpful information, even when it would have been beneficial for her to do so. I cannot wait to see her character develop even more in the second book.Adam…where do I start with Adam? I liked him right from his introduction, even if Terra didn’t. However, I did expect him to just be a typical Skydweller (although my view on them was tainted by Terra’s opinions) and a typical love interest. But Adam was actually a very complex character with his own secrets, including one very large secret that I did not expect at all. Like, that one completely came out of nowhere and presented itself to me and I just kind of sat there with my mouth hanging open. I love being surprised by books and that surprise was awesome. I spent most of my time half-expecting Adam to land Terra in a terribly situation, but I needn’t have bothered, because Terra did that herself, leaving Adam to save the day. Terra and Adam’s chemistry was fantastic too, it’s so easy to see that Adam cares for Terra a lot, even though they have a lot working against them.Terra had a really interesting plot that has left me desperate to know how the story continues with the rest of the series. I’m definitely expecting Terra to pull through and save the world because she is one hell of an awesome character! I spent a lot of time wondering whether Terra and Mica’s father will make an appearance later on in the series and what kind of role he’ll play. I hope he explains why he abandoned Terra and Mica too, because that was a totally uncool thing to happen to them. All in all, Terra was a really gripping dystopian packed full of action and incredibly well-written with a host of fantastic characters, and I cannot wait to see how the series develops and where Adam and Terra end up taking us. So what are you waiting for?! Pick this one up, and you really won’t regret it!I received a copy of this book in exchange for an honest review.